Denver is really wintry right now. In the last week we've had probably 14 or 15 inches, and it's still coming down. Not as bad as last year's Christmas and New Year's blizzards, which put down close to 3 feet of the stuff, but enough to make me glad I wasn't planning on any traveling this year! Christmas Day I walked the mile over to my sister's house rather than go though the sequence of remove snow from the vehicle, shovel area necessary to open back gate, drive down snow-clogged alley, pick way carefully along icy and/or snow-packed streets, then repeat sequence in reverse in the evening... At least it's nice dry powder, easy to shovel. ’n ôl noson hiraf daw y wawr. and dawn will follow the longest night. recalls the Gift of that night. when you lift your hearts in song. and the English won that war. in the snows of winter bleak. in your houses safe and warm. may come from unending night. for Llywelyn in the snow. body and blood – and tears. lost in a library stack. when Wales lost her earthly king. as we look back from afar. I haven't been posting for a couple of weeks, partly because I wanted to leave the two book blurbs at the top of the blog for a while, and partly because life has been, well, hectic. Hopefully things will slow down again soon and I'll have more time to write, review reference books, and do all those other things a blogger should do. Regarding writing - I've managed two chapters of the next book - The Ash Spear - so far, and already the plot is acquiring unexpected dimensions. This is good, because it's exciting for me, and because it makes for a better book for you. I'm looking forward to having a couple of weeks off at Christmas and really making progress. Since I've been posting links to this site on some of my yahoo lists, I thought I'd also post the back cover descriptions for the two books here. Britain in the summer of 551 AD: The North is a tinderbox about to burst into flame, the Saxons are stirring again in the east, and Cynan Garwyn, Prince of Powys, is doing his best to foment war in the South. In the midst of this simmering chaos, two young bards — Gwernin the Storyteller and his friend Neirin mab Dwywei, the Poet-Prince who some call “Taliesin’s Hawk” — are sent by their master to investigate the rumors and do what they can to prevent a war in the North. At least, that was their mission — but the two young men find plenty of other adventures along the way. Girls and beer, bloodshed and magic: will they survive the summer and make it home alive? I hope to finally get a book review up over the Thanksgiving holidays. In the meantime, for those of you in the U.S., enjoy your turkey! Flight of the Hawk is finally available from Amazon, B&N, etc. - links on the sidebar! Well, I didn't get a book review up over the weekend, but I did get the first chapter of the new book written. That first step seems like a big one - you circle around thinking about when and where and who, how much of a frame, how to work the backstory in without overwhelming people, ditto how to introduce six or seven characters with strange names (an inescapable problem when writing about medieval Wales). I think I struck a fairly good balance, although inevitably tweaking will go on for a while. Now I should be able to settle down and get on with the story. The first book "just grew", the second one was vaguely planned, and the third one is showing signs of an alarming amount of plot complexity (necessary when planning to fit several story strands in a limited amount of pages). I am fending off the temptation to box it in too much, though - if I knew it all before I started, it wouldn't be fun! I'm finally getting started on the new book - I wrote the first couple of hundred words this afternoon, and I'm looking forward to really getting into it this weekend. The beginning is there, and waiting any longer would let it get stale. It's good to be setting off again, starting a new adventure, with hopefully some quiet time in the winter ahead. Although I keep saying this one won't be done until sometime in 2009, I realize that sooner would be better. I should have another reference book review or two up soon, as well. I've been reading up on the Irish this time. Not my novel, mind you, and not Neirin either (although he will reappear in the next book), but the falcon at the bird feeder. He (or she) didn't arrive in pursuit of sparrows this time, just flew down and perched on the cross-bar of the clothesline and sat there for a couple of minutes looking around. This gave me a better sense of scale than I had the first time, and led me to rethink my identification: I think it's a peregrine falcon! Unlikely to have two different hawks a week apart, and I know there are peregrines in Denver, originally introduced downtown to keep down the pigeon population. Explains the occasional excess of pigeon feathers (and once, gobbets of pigeon) I've seen around the feeder from time to time. I thought of writing about Samhain - the Celtic Halloween - today, but decided instead to post an excerpt from Storyteller and let you read the Wikipedia article yourselves. [In order to make the crown] ... we first needed gold from seven British Kings. Now the crowned Kings of Britain in those days were Tudwal Tudclyd of Strathclyde, and Cynwyd of Eidyn, and Cynfarch Oer of Rheged, and Lleenawg of Elmet, and Maelgwn Hir of Gwynedd, and Brochfael Ysgithog of Powys, and Geraint mab Erbin of Dumnonia. And this gathering of gold from them was no easy task; for many considered Arthur to be an upstart, with no good claim to Uthur Pendragon’s chair, while others had ambitions themselves to be High King. And in order for our magic to be true and right and potent, we might not get the gold other than by free gift. So my Master devised a plan, and it was this: no King could risk the dispraise of a pencerdd, a master bard, however strong he felt himself, whether the dispraise was only by silence, the mere omission of his name from a list of Generous Ones, or by the sharper attack of satire. If each King were to believe that all the others in our list had given generous gifts to our endeavor, than each in his turn would give as well, not to be outdone. The difficulty lay in starting the process. We went, therefore, first to the court of Rheged, which was ruled in those days by Cynfarch Oer, Cynfarch the Cold, who could as well have been called Cynfarch Caled, Cynfarch the Miser. For as my Master said truly, if we could win gold freely given from that skinflint, than no one else would dare to hold back, for fear of dishonor. And we arrived on the eve of Samhain, then as now one of the great festivals of the year, when even Cynfarch would be forced to hold a feast. Now my Master's name was known in those days the length and breadth of Britain, and not for lack of resource. So in order not to put Cynfarch on his guard, we agreed that I would appear in my own proper person, but that he would dress himself in our oldest clothes and pretend to be my servant. And thus we arrived at Cynfarch’s hall, where a feast – of sorts – was in progress. Cold, did I say was Cynfarch's calling? Cold was the hospitality of his hall as well. Few indeed were the torches that lit that hall, and small and feeble the hearth-fire, so it was little enough that could be seen through the drifting haze of smoke. The benches were thronged by such as had no hope of better entertainment elsewhere, but little good did they get by it, for the bowls of broken meats came half-empty to the table, and the drink was small sour beer. It is true that Cynfarch's retinue was served somewhat better – a war-band which is not feasted will soon find another lord – and better yet was the food on Cynfarch's own table, but I swear to you that Arthur's war-band in the field after a three-day's battle ate better than he. Nevertheless, we came into the hall, and I followed close after the porter to be announced, while my Master joined the servants near the door. Now Cynfarch, though a miser, was no fool; and my own name was not unknown in the land of Britain. Yet like all those who value gear and goods above honor, he could not resist the prospect of getting something for nothing, or nearly nothing: in this case, my songs in exchange for his poor entertainment. It would be a bold bard who satirized him there in his own hall; and if my praise was less than fulsome, why, he could live with that. Indeed, he had been doing so for a long time. So he waved me to a seat at his own table, and presently he bade me sing. I sang, first, a song in praise of Arthur, calling him Bull of Battle and Bulwark of Britain, Red-Ravager and Gold-Giver. This produced a little applause from Cynfarch, but rather more from his war-band, who like everyone else had heard tales of Arthur's success. Clearly they were now wondering if he might be a more generous provider than Cynfarch. Next I told the tale of Pwyll's winning of Rhiannon, when he comes to her wedding feast dressed as a beggar but carrying a magic bag which cannot be filled, however much is put into it. At this I heard one of the retinue say to another, "Well for him that he came not here!" and laugh, and Cynfarch shifted uneasily in his chair. "Have you no better tales than this?" he asked me. "Give me something new." "Alas, Lord," I said, "I am weary from traveling and need food and time to rest. Perhaps you would hear a tale from my servant while I eat? He is not without experience." "Gladly," said Cynfarch. "Let him come up." My Master came to the front of the hall, still in his disguise. "Good evening to you, Lord," he said. "Would you hear a tale suited to the night, which I learned long ago in Ireland?" "Gladly," said Cynfarch. "Tell your tale." My Master then began to tell the most terrifying story I have ever heard, of unquiet spirits and monsters which could not be killed, and murdered men returning from the grave for vengeance, their empty eyes burning with the fires of hell. And as he spoke the hall grew darker, and the torches burned faint and blue, and outside the wind rose and moaned about the court, and there were voices in it. Even the retinue grew quiet and huddled closer together on their benches; and their faces were pale, and their hands moved uneasily now and then to their knife-hilts. Cynfarch's eyes went round and round the hall, as if he saw movement in the shadows, and sweat stood upon his brow; and I myself felt the skin creep on my shoulders, and the hairs on my neck stand up. And still my Master spoke, and the wind rose, and one or two of the torches flickered and went out. At last Cynfarch could stand no more. "Enough!" he cried. "End your tale now, old man!" "But how shall I do that," my Master asked, "and the tale not half finished?" "I will pay you to end it," said Cynfarch. "In silver, if need be." "Nay," said my Master, "that would be ill doing. For it would be bad luck to me to end the tale untimely, and silver is not enough to pay for that misfortune." "Let it be gold, then," said Cynfarch, and he hauled off from his arm the great twisted bracelet of red gold which he wore there, and which no one had ever seen him without, and threw it into my Master’s hands. "Take it, and be silent." And my Master bowed, and turned away; and as he did so, the torches burned up again, and the wind died away to nothing. Happy Samhain to you all! After last weekend's snow, the weather has warmed up again. I spent a lot of time today doing garden cleanup and thinking about the next book. Clipping the dead sunflowers out of the potato patch, I tried to transpose a scrap of medieval gossip back several hundred years. The stated motives for someone's actions concerned illegitimacy - but this makes no sense in medieval Welsh law, where all acknowledged sons shared equally (see the history of 12th and 13th century Wales for working examples, or read Edith Pargeter's Brothers of Gwynedd quartet). So what did X think he was doing? There has to be logic in there somewhere... Removing the frost-killed pepper plants and tomato vines, I thought about balance. What, or who, is my story really about? The historical background, or Gwernin himself? About that time my train of thought was derailed when a kestrel dived into the cloud of sparrows around the bird feeder. The sparrows took refuge in the rose bushes, chirping hysterically; the falcon, disgruntled, watched them for a while, and then flew away when the cats came to check on the excitement. And I went back to clipping dead tomato vines. The plot? Well, we'll just have to wait and see. Here in Denver today we're having our first snowstorm of the season. Heavy, wet, clinging to the leaves which haven't yet fallen (which is most of them - only a few of the ash trees are sensibly bare), bending them over under their icy burden. If the temperature inches up another degree or two, much of it will probably drop off, but for now I keep a watch and occasionally go out with a broom to shake the roses, the young maples, and the drooping rowan tree. The cats are not happy today; they want out, but don't like it when they get there. Yesterday was warm, dry, and sunny - "the warm before the storm" we call it. 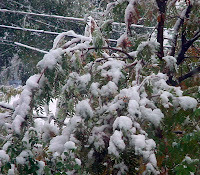 This snow won't last; in a day or two it will be gone, and we'll be back to mild autumn for a while longer. It's a reminder, though, that winter is on its way: the dark half of the year starts at Samhain. Winter in Gwernin's time was not the pleasure that some people find it today, but rather something to get through, hopefully alive. The lord in his hall might be happy enough, with a roaring fire and plenty of food, but then as now the poor man suffered, and some of the poetry reflects this. 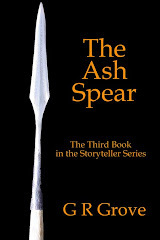 The dark half of the year is the time for stories, and I am taking thought to my next book, The Ash Spear. I am thinking about doing a revision of Storyteller to catch a few typos and upgrade the cover. What do folks think of the design on the sidebar as opposed to the original cover? Last night I pushed the button, so to speak, for distribution of Flight of the Hawk. It's available on Lulu now, and should reach Amazon, B&N, etc. in two to three weeks. There's also an ebook version on Lulu. First, the October Promotion is going well - twenty seven people so far have downloaded free PDF copies of Storyteller, and I hope will be sharing them with their friends. I can't afford to give hard copies away, but sharing ebooks costs me nothing, and I'm glad to have the chance to do it. Today I got the second proof copy of Flight of the Hawk, and it looks good. Inevitably there must be a couple more typos somewhere - there always are! - but I'm not going to search for them: 99% correct is close enough. There'll be a PDF version of this book, too, although not a free one ... at least not now. I haven't been posting much in the last week because I'm on the (absolutely, positively, I mean it this time!) last editing pass through Hawk. Once I've finalized that, I'll have time for a few other things like reference book reviews and general creativity. It's taken quite a lot of time and work (thanks, Rivkah and Rowen!) but I think it's been worth it in terms of a really clean final draft. And we're still on schedule for November 1st. But that's truly a story for another day. In the run-up to the November release of Flight of the Hawk, I am making the pdf version of Storyteller a free download from my Lulu storefront. Anyone who would like it but doesn't want to create a (free) Lulu account in order to get the download can email me at the address on the sidebar, and I'll send you one direct. Not only is this ebook available free, but I actively encourage you to share it with anyone you think might be interested under a Creative Commons license! Meanwhile, final revision on Flight of the Hawk continues on schedule for its November 1st release. Seven more days until October, and my October Promotion. "What's so special about October?" you may ask, if you haven't been reading this blog. "Not hard," I reply. "During October the e-book version of Storyteller, the first book in my developing series, will be free for download. This is to encourage more people to read it before Flight of the Hawk is released in November." Yes, during the month of October you can download Storyteller for free from Lulu.com, and if that's too hard -- if you don't want to go to the trouble of creating a (free) Lulu account in order to get a free e-book -- you can email me at the address on the sidebar, and I'll personally send you your very own copy. Not only that, but the e-version of Storyteller now comes under a Creative Commons license, to encourage everyone interested to not only get it free and read it, but share it freely with any interested (or uninterested) friends. Why am I giving the e-book version of Storyteller away? Well, first of all, I didn't write these stories to make money (the fact that I'm publishing them with Lulu.com tells you that). I wrote them for fun and sharing. Secondly, I think if you read Storyteller, you'll want more of Gwernin's adventures. That takes us to Flight of the Hawk and its several planned sequels. I expect to be writing these stories of a long time, and the more readers who want to come along with me on that journey, the better. And thirdly, I think the more people who are aware of Storyteller's existence, the better my chances of selling physical books -- for more on that idea, look here. As to what comes after Flight of the Hawk -- well, that's a post for another day. This week's pick: Trioedd Ynys Prydein: The Triads of the Island of Britain, edited by Rachel Bromwich. This is the long-awaited 3rd and final edition, published by the University of Wales Press in February 2006. At 768 pages and $145, this is neither light nor inexpensive reading, but for those interested in Welsh history and literature - and especially the bardic arts of poetry and storytelling - it is a treasure-trove, not only for the material in the triads themselves but for the extensive footnotes and commentary that goes with them. The contents: Introduction (Manuscripts and Versions; Origin and Development of Trioedd Ynys Prydein) (99 pages); the Appendices (16 pages); Trioedd Ynys Prydein (Text and four appendices (The Names of the Island of Britain; The Descent of the Men of the North; The Thirteen Treasures of the Island of Britain; The Twenty-Four Knights of Arthur's Court) (270 pages); Notes to Personal Names (46 pages); Abbreviations, Select Bibliography, and Index. "2. Three Generous (Noble/Victorious) Men of the Island of Britain: Nudd the Generous, son of Senyllt; Mordaf the Generous, son of Serwan; Rhydderch the Generous, son of Tudwal Tudglyd. (And Arthur himself was more generous than the three.)" "21. Three Diademed Battle-leaders of the Island of Britain: Drystan son of Tallwch, and Hueil son of Caw, and Cai son of Cynyr of the Fine Beard. And one was diademed above the three of them: that was Bedwyr son of Bedrawc." Trioedd Ynys Prydein is a book for browsing, not for reading straight through. For those interested in Welsh sources, it will provide many happy hours. Highly recommended. The autumn equinox falls on September 23rd this year. Some years it is on the 22nd. Theoretically the day and night are of equal length that day, although I find it tends to vary a bit depending on where you live, like the solstices. The equinoxes are also the time in the year when the length of the days and nights is changing fastest. Here in Denver that amounts to about two and a half minutes per day, but in northern Europe it's faster - almost four minutes per day in London, four and a half minutes in Edinburgh, close to five in Inverness, and over five in the Orkneys. I saw this when I lived in Juneau (5 minutes per day) where it really made an impression on me - the day/night cycle there is like a great tide of light, rising and falling with the seasons, all of life borne along on it. Tomorrow I should have another reference book review. In the meantime, may you have a good autumn (or spring in the Southern Hemisphere) day. Today, for lack of any other inspiration, I'm posting a poem I wrote a few years ago. The form is the sestina, and the story is from the First Branch of the Mabinogion. The poem is from my collection Pryderi's Pigs and Other Poems. the taste of mead, the touch of your white hand. disguised and held in idleness year-long. I spent my days and nights in play and song. into the world for which I now did long. But every night that year was hard and long. whose magic set me on this secret track. against the other claimant for this land. and in the ford I flung him dying back. was easy. Sunlight shone upon my track. and he did vow to be my friend life-long. rejoiced at my returning to my land. Yet sometimes I look back when night is long. The track I went’s now but a winter’s song. I lost your hand to win again my land. This week's pick: Life of St Columba by Adomnan of Iona, translated by Richard Sharpe. Retail price $16.00, currently $12.00 on Amazon. Running to 432 pages, including 10 pages of maps and geneologcial tables, an introduction (100 pages), the translated Life (134 pages), scholarly footnotes (144 pages), bibliography and index, this is almost two books in one, and good value for the modest price. I began reading this book reluctantly as part of the research for my Storyteller series, because Columba's life (521?-597) spans the period of my stories. I expected a dry, boring read: I was wrong. The introduction is interesting and well-written, with a large amount of helpful historical detail about the people and customs of this period, and the Life itself is lively and entertaining. Columba and his monastic family were important figures in 6th-8th century Scotland and Ireland, and anyone interested in this period should know their acts and history. If you fall in this category, buy this book now and read it: at only $12, you have no excuse. Highly recommended. Starting October 1, I am making the e-book format of Storyteller available as a free download on Lulu.com. And for people who don't want to open a (free) Lulu account just to get a free e-book -- email me at the address on the sidebar and I'll send you one directly. Can't beat that, can you? Remember: this offer starts October 1, and will continue at least until November when Flight of the Hawk is released, and possibly longer. So be prepared! I'm back from a long weekend traveling to Wisconsin to see a good friend get an important SCA award - and my proof copies have arrived! So far I've seen one or two details I need to clean up, but on the whole I think it looks great. It's a thrill to finally have the physical item in my hands! It will be a couple of days before I get another reference book review up, but now that I'm done traveling for a while normal service should resume shortly. I haven't been as regular as I'd have liked with the review feature, partly due to a lot of travel in August and partly due to the amount of work involved in readying Flight of the Hawk for publication. In an effort to get back on schedule, here is another recent acquisition from my bookshelf. This week's choice: The Roman Cavalry by Karen R. Dixon. 272 pages. At $39.01 on amazon.com ($40.05 retail) the book is reasonable value for money. The author is a professional archaeological illustrator. Contents: Sources; Origins, unit strength, organization and titulature; Equipment and unit armament styles; Recruitment; Conditions of service; Training; The hippika gymnasia; The employment of cavalry in peacetime and wartime; Military records and the supply of horses; Roman cavalry mounts; Stables and grooming; Water and food supply; Welfare; Baggage animals. Well illustrated with line drawings and black and white photographs. The author uses information from classical sources combined with archaeological findings and data from 19th and early 20th century European records to give a fairly detailed picture of the Roman cavalry over a period of several centuries. We learn about the recruitment, training, and equipment of both men and horses and their shared life together. Although I would have liked to see a little more detail in certain sections, this is a good overview. I notice that Dixon has also co-authored a study of Roman cavalry equipment, which may have the color plates this volume lacks. The Roman Cavalry by Karen R. Dixon: recommended. Finally got the cover to display correctly on the sidebar! Britain in the summer of 551 AD: The North is a tinderbox about to burst into flame, the Saxons are stirring again in the east, and Cynan Garwyn, Prince of Powys, is doing his best to foment war in the South. In the midst of this simmering chaos, two young bards - Gwernin Storyteller and his friend Neirin mab Dwywei, the Poet-Prince that some call "Taliesin's Hawk" - are sent to the North by their master to investigate the rumors and do what they can to prevent a war. At least, that was their mission - but the two young men find plenty of other adventures along the way. Girls and beer, bloodshed and magic - will they survive the summer and make it home alive? I'm still having trouble with the sidebar, but here's the cover for Hawk. I'm really excited about the way it's all coming together. At this point I'm looking for pre-release reviews - the scheduled release date is still November 1. Totally unsolicited, from someone who bought the e-book version on Lulu: take a look! Photoshop and I are becoming well acquainted. I've got Elements 5, and I like it --the Missing Manual helps a lot. So does my background in technical illustration and AutoCAD. After I get Flight of the Hawk published, I'm going to do a revision on Storyteller to make the cover more what I actually wanted instead of what the contractor delivered, and fix a few other minor glitches at the same time. After that, on to the the next book: The Ash Spear. But that's a post for another day. In attempting to replace the earlier cover concept for Flight of the Hawk with the final on the sidebar, I've run into some sort of technical glitch - the image loads, but it's stretched horizontally. I think this is Blogger's fault, but for the moment, no cover picture. It *will* be back! I'm still on schedule with Flight of the Hawk. The front and back cover are done, and I'll be working on the maps today. I'm also on what I hope will be the final editing pass for the manuscript. So things are looking good! In the meantime, while I was out of town last week, I was mildly surprised to find ideas popping up for the next book. This one will be titled The Ash Spear, and will start about six months after Hawk ends. The title has a double meaning, which I'll explain presently. I'll also be doing a special promotion in October - but that's a subject for another post. Today's pick: Warlords and Holy Men: Scotland AD 80-1000, by Alfred P Smyth. First published in 1984; most recently reprinted by Edinburgh University Press in 2003. The author is a reader in Medieval History at the University of Kent. This book won the 1985 Spring Book Award for Literature from the Scottish Arts Council, and one can see why. A wide-ranging, enthusiastic and scholarly work, it covers a great deal of ground with a surprising amount of detail for its size. Although some of the archaeological conclusions have changed in the intervening thirty years, this is still a good introduction to the period and good value for money at $24.00. Topics include: Roman Britain, the Picts, St. Columba, Adomnan, Vikings, the orgins of medieval Scotland, and the conquest of the southern uplands. The author shows an impressive ability to look at the larger picture while not losing sight of details, an ability which allows him to combine seeming isolated facts into interesting combinations. Whether or not you agree with all of his conclusions, you will find many that are thought-provoking. An example is his dating of the final collapse of the British kingdom of Rheged by the series of entries in the Irish Annals of Ulster regarding the presence of roving bands of British warriors in Ireland between 682 and 709. Highly recommended. So this week I'm stuck out of town on business without the internet access I expected. With luck, though, I'll at least manage that next book review before the end of the week. In the meantime I'm taking a break from writing and editing Flight of the Hawk and actually reading someone else's fiction (gasp!). No worries, though -- Hawk is still on schedule for its November release! Slow getting started at the blog again, anyway, although I've been busy in the background. I'm trying to come up with a way to make chapters of Storyteller available though links on the blog, but so far have hit a few technical glitches. Coming soon: a website at Alder Tree Books, where I can offer that sort of thing. More soon - in the meantime, keep reading; there is lots of material in the archives! Rowen again. . . . I know I said, next time, linen, but I've been having a few more thoughts on wool. Well, a person in the Middle Ages who was genuinely allergic to wool would indeed have had quite a problem, but I wonder, how many people *really* were? But consider – medieval wool was washed, yes, and often dyed – but never dry-cleaned, never treated with any amount of the chemical substances currently used somewhere along the path between the sheep and the shirt. True, ascetics often wore wool without linen under it (linen inner garments were considered upper-class, and maybe just a bit decadent in the 6th and 7th centuries in Britain) and fine soft wool was always to be preferred over coarse or hairy wool, but I doubt very much that there were all that many folk in medieval Europe suffering from itching – or at least not from their woolen clothes. But that’s a thought for another day. Got back last night from Pennsic War after two days and 1475 long miles of driving ... now to unload the truck. Actually, we got the tent out and draped it over the clothes line last night so it can dry properly, but there are still a lot of bins to shift, gear to clean and repack for storage, etc, etc. Probably won't do another camping event until February and Estrella War, but it's never to soon to start planning and preparation. Why do it? I asked in my last blog. For love. For seeing friends you wouldn't otherwise have met, let alone seen again. For sharing songs and stories around the bardic fire. If you're a fighter, for the fighting. And for most of us at some point, the shopping. But mostly for the people we love, and with whom we share a dream. More tomorrow, when I've caught up on my email / unpacking / rest. Pennsic War is almost over for the year, and tomorrow I start the long drive back to Denver. I should be blogging again as usual on Tuesday, so the silence here will end. 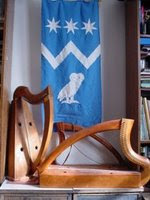 Thanks to Rowen for providing the guest blog on textiles, and I hope she will be contributing again from time to time. As to Pennsic War itself - why would any semi-sane individual drive two days (or more) at current gas prices in order to camp for two weeks in a (frequently) soggy field in Western Pennsylvania's heat and humidity along with 11,000+ other people? That will be my next blog post! More specifically, what fibers were Gwernin's people using to make cloth & clothing? And where were they getting them? Archaeological evidence for 6th c Britain gives us two main fibers, wool and linen, and very, very rare bits of silk. Just now I'm going to talk a bit about wool. In addition to dyed or natural colors, garments could have been – and were – decorated with stitchery or embroidery, contrasting bands of fabric or tablet-weaving at the neck and sleeves, or enhanced by the pattern of the weaving: a broken twill or herringbone, or diamond-twill pattern took more time and skill on the part of the weaver than a simple tabby (basic over/under) weave. Deep, rich colors were more time-intensive to dye, and might call for (expensive) imported ingredients. The easiest and most common local dyes produced a range of yellow/gold, brown, and greenish shades, but some herbs and lichens could produce astonishing purple, cerise and orange tones. Modern taste often leans toward the irregular weave or dye-lot as looking “more hand-made,” but in a world where every single thread of every single piece of fabric – a queen’s coronation gown, an infant’s swaddling bands, sails for ships or sheets for beds – had first to be spun on a drop-spindle before it could be woven, the smoother thread and the even weave or dye-job were a sign of greater skill, and produced an object of higher status. Next time: some thoughts on linen. That's all I have time for - I'm off at dawn for Pennsic War. While I'm gone, a guest blogger may be filling in for me from time to time. Before I forget - the answer to Friday's riddle is "a harp." Today's pick: The Iron Age in Northern Britain: Celts and Romans, Natives and Invaders, by D. W. Harding, professor of archaeology at the University of Edinburgh. First published in 2004 by Routledge. A bit expensive at $49.95 for 368 pages, but still very good value. Copiously illustrated with black and white photographs - many of them excellent aerial shots taken by the author - and line drawings. Plenty of maps, too. Again, this is a university-level textbook, not a coffee-table book. As the subtitle makes clear, this book covers a longer period than is usually implied by the term "Iron Age" in southern Britain, generally terminated with the Roman Conquest in 43 AD. In contrast the northern British Iron Age continued from the mid-first millennium BC to the period of Norse settlement in the late-first millennium AD. A distillation of the author's fifty years' involvement with British Archaeology, in locations ranging from Wessex to the Outer Hebrides, this is not light reading, but the insights and clearly expressed explanations of how archaeology works make the persistence needed to get through the volume worthwhile. He is also good at pointing out the weaknesses of various received theories, as for example his closing comments about the Picts: "Differences between the Pictish language and the Gallo-Brittonic of the Votadini to the south should not be magnified into a major linguistic and cultural watershed on account of a relatively short-lived political anomaly of the mid-second century AD ... older elements in topographical names could doubtless be detected elsewhere without fundamentally undermining our perception of the native communities of Iron Age Britain. The demise of the Picts and Pictish language by the tenth century ... might occasion less surprise if the assumed archaeological associations of the Picts were examined more rigorously in the first place." Highly recommended. and flameless burns with Apollo's fire. Then there's the last-minute sewing projects, and this year the "bookstore" as well. I'll be taking thirty copies of Storyteller with me and selling them through one of the merchants (also an SCA bard). Busy, busy, busy ... at least the weather's cooler here for the next couple of days, which will help. Today's pick: Eating and Drinking in Roman Britain, by H. E. M. Cool, a professional archaeologist and archaeological consultant. First published in 2006 by Cambridge University Press. The paperback edition is good value at 294 pages for $36.99, and even better at Amazon's current discount price ($29.59). No color plates, but a reasonable number of black and white photographs and some nice line drawings, also a lot of tabulated data of various types. There are also good reference maps in the front for the various localities discussed - particularly helpful for those not familiar with British geography. The reference list is good, and the data for the tables is fully and professionally attributed in the appendices. This is a book for the serious Roman Britain enthusiast, amateur or professional. In addition the book is clearly and even amusingly written, with a dry and perceptive wit which makes it a pleasure to read. A brief quote from the preface will show the flavor: "Roman Britain is a very strange place, much stranger than the many popular books written about it would lead one to think ... This book is offered as a kind of hitchhiker's guide to those who would like to explore this material, but who lose the will to live when faced with the reams of specialist reports that even a minor excavation can generate." After an introductory chapter ("Aperitif"), the author discusses the food itself, packaging, what we can learn from human remains, written evidence, kitchen and dining basics, staples, meat, dairy products, poultry and eggs, fish and shellfish, game, greens, and drink. This is followed by four time-based chapters covering the conquest, the development and decline of Roman Britain, and the period after the Roman withdrawal. This book will not give you recipes for Roman Britain - there are other books for that - but it will tell you the state of current archaeological knowledge regarding what foodstuffs and drinks were available in various parts of the country and how people were probably using them. In the process the author uses this evidence to tell us some surprising things about those people themselves. Highly recommended. OK, there's still a lot of proofreading and formatting work, cover and book design, maps and appendices to do. But I've finished the last chapter of Flight of the Hawk. On schedule, too! Hooray! Now back to the grindstone in hot, sunny Denver, where I suddenly have all the ripe tomatoes I can eat. In Tuesday's post I mentioned that the riddle I was printing was from my poetry collection called Guernen Sang Again: Pryderi's Pigs and Other Poems. This is the second of the two poetry books I have available on Lulu.com; the first is titled Guernen Sang It: King Arthur's Raid on Hell and Other Poems. So what's the logic behind these titles? What is this "Guernen Sang It" business? The idea comes from the early Welsh poem (or collection of poems) called Y Gododdin. This poem is attributed to someone called Aneirin, who is supposed to have been famous as a bard or poet in 6th century Britain. The only surviving copy of his work is a manuscript called Llyfr Aneinin - the book of Aneirin - which currently resides in the National Library of Wales at Aberystwth. And at the beginning of the manuscript someone has written, "Hon yw y Gododdin - Aneirin ei cant" - "This is the Gododdin - Aneirin sang it." So when I collected my poems for publication - poems mostly written in and for the SCA - I followed my medieval exemplar in the title. And the "Guernen" part? Not hard - my official name in the SCA is Guernen Cimarguid. But that is a story for another day. Another new feature - mini-reviews for reference books I've found useful, or recently discovered, or just enjoy. Today's pick: The Archeology of Celtic Britain and Ireland c. AD 400-1200, by Lloyd Laing, professor of archeology at the University of Nottingham. First published in 2006 by Cambridge University Press. At 420 pages, copiously illustrated with line drawings and black and white photographs, this is good value for money ($50 for the paperback edition on Amazon). No color plates, but you can't have everything. This is essentially a university-level textbook, not a mass-market coffee table book. The material is clearly written and extremely well-organized, and the author has, as he says in the preface, "endeavoured to remove as much jargon as is feasible." The book includes three appendices, abundant footnotes, suggestions for further reading, and an impressive bibliography. After an introduction and a general survey of the Celtic world, the author gets down to details. The next eight chapters cover settlements, farming, everyday objects and equipment, industry and technology, trade and communications, clothes and jewelry, art and ornament, and the church. This is followed by area-specific chapters on south-western Britain, Wales, Ireland and the Isle of Man, Southern Scotland and northern England, and Northern Scotland. To cover all this ground in the space available (the appendices start at page 335) means that no discussion can be in any great depth, but Laing still manages to cram in an impressive amount of detail, and the abundant citations allow the interested reader to follow up on any particular point. No space is wasted on philosophical arm-waving; this is an "only the facts" treatment. I recommend it heartily. In order to post more often, I'm going to try something different. The following piece is from my poetry collection Guernen Sang Again: Pryderi's Pigs and other poems, available as a free download on Lulu.com. This one is a riddle - I'll post the answer on thursday. or garden bright where brilliant flowers grow. the answer’s here before your dreaming eyes! Back to the Law of Hywel Dda again, with some snippets about coming of age. Young children up to seven years old were considered to have no legal capacity or judgment: "until [the child] is seven years old it is right for its father to swear and to pay on its behalf ... [because] the child has no judgement." "A daughter, after she is baptised, until she is seven years old, is not entitled to take an oath." The father is bound to make good any damage the child does, just as for animals. "From the end of its seventh year, it is for the child itself to swear for its acts, and for its father to pay." Maturity for boys was fourteen. "From when the son is born until he is fourteen years old, it is right for him to be at his father's platter, with his father as lord over him. And no punishment of him is right save his father's." If his father should die before he is fourteen, the lord appoints a guardian for him. When the boy turns fourteen, however, "it is right for the father to take his son to the lord and commend him to him. And then it is right for him [i.e., the son] to do homage to the lord, and to be dependent on his lord's status; and it is for him himself to answer on his own behalf to every claim that is made against him ... his father is from then on no more entitled to strike him than a stranger." Girls, it was recognized, mature earlier. "From when she is born until she is twelve years old it is right for her to be at her father's platter. From twelve years old ... she is ... of age to be given to a husband; and from then on, even if she does not take a husband she is entitled to control what is hers, and it is not right for her to be at her father's platter unless he himself wishes it." I have a theory that because people were legally recognized as adults so much earlier, there was no teenage rebellion to speak of in medieval Wales. It hasn't been a good week for blogging - my turn for a revolving extra duty at work, which tends to break up the day and keep me here later than usual. On the writing front, I've finished the first draft of Hawk except for the last chapter, and am filling in the time while I wait for an undisturbed weekend (hint: this won't be one) by copy editing the rest. I know what goes in the last chapter, which should be relatively easy to write, but it doesn't hurt to have the whole course of the book fresh in my mind before I do it. And in two and a half weeks I go to Pennsic War! It was a very good weekend. Imagine a tent as high and long and wide as a king's hall. A tent of white canvas, made in sections, open at the ends to the night breezes; open here and there between the sections to the night sky. Imagine pine trees around it, and more stars overhead than you've seen in many, many, many years. Imagine a fire in the middle of the tent-hall, bright and central as the fire in a British mead-hall. Along the sides of the hall and in the back are chairs. At the head of the hall, a King's and Queen's thrones. Imagine people in the chairs, and a crowned King and Queen on the thrones. They are waiting, all of them, for a performance. They are waiting, all of them, to choose a Royal Bard. The first of five competitors rises and steps out beside the fire, and begins to sing. She sings in Welsh and then in the common tongue, a lament made by a bard for a king's son in the very-long-ago. She sits down, and the second bard arises, to declaim poetry. And so it goes, until each has performed twice. The King and Queen retire to consult, and return to announce their decision to the people's applause. And the night's performances have only just begun. Stories, songs, poetry, poured out like a bright stream from the cauldron of inspiration. At last the night is old, and the fire is quenched, and all those in the tent-hall stumble off through the darkness to their beds. Welcome to the Current Middle Ages, and the best of being a bard at an SCA war. Probably no more posts on Tre Gwernin until Monday, as I'll be involved in the big northern Outlands event, Glory War, for the next few days. This will include bardic circles, bardic classes, and bardic competitions, among other delights; I'll also spend a certain amount of time wandering around with my harp. More about all these activities when I get back. Another writing update -- I'm on the last chapter of Flight of the Hawk, and could sit down and finish it now if I wasn't busy packing for war. It still needs some polishing and proof-reading, but I'm very satisfied with the book as a whole. There is a good bit more action compared to Storyteller, and more of an overall plotline, though there are also some new interior stories as well. Although the book starts off where Storyteller ended, I think I've included enough backstory that it should be a good independent read. In the meantime, happy (what's left of the) 4th of July to all! A little more about the training and repertoire of the Irish bards, based on Proinsias Mac Cana's The Learned Tales of Medieval Ireland. Regarding the development of the poetic curriculum, he says, "in its earliest form the curriculum envisaged the student-poet as passing through these [seven] grades [of filid] in a period of seven years. But the curriculum was gradually lengthened, at least in theory, and in the next stage ... it extended over ten years ... in its final form ... [the curriculum] ... cover[ed] a course of twelve years." The subjects to be studied in the first year included twenty tales, in the second year, thirty, and so on, until in the seventh and final year the original curriculum would have included eighty tales. What is not clear is whether the number of tales was inclusive of those previously learned, or represented the number of new items to be learned in a year. The latter supposition would result in the number of 350 given by one of the two extant tale lists as "the professional qualification of the fili in so far as it consists of stories and coimcne to be narrated to kings and princes." Whichever interpretation is correct, it is clear the fili was supposed to know, and in some cases to tell, a very large number of stories and other traditional items of lore. According to an eighth century tale, "when Forgoll the fili came on visitation to the royal house of Mongan mac Fiachna, he told a tale every night ... and such was his learning that they continued thus from Samain to Beltaine." A master-poet with 350 tales at his command could keep this up for a year. Some tales, however, were only supposed to be told during the winter, between Samhain and Beltane. 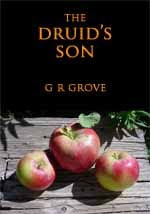 This included especially the hero-tales, the tales of battles and raids and ravagings, expeditions to the underworld, and the birth and death of the hero himself: for in the Celtic lands it was the hero's death as much as his life which defined how he would be remembered. As Y Gododdin says, "he slew a multitude to win undying fame." No, I haven't fallen off the face of the earth - or at least, not quite. Last week I was mostly too busy for posting, and since Thursday I've been writing. I'm on the home stretch with Hawk now, with two and a half chapters to go, and things are still looking good for a November release. Then I might take a couple of months off and actually read other fiction, something I haven't done in quite some time. The wait for the next book - tentatively titled The Ash Spear - will be a little longer; it probably won't be finished until some time in 2009. I had a headstart on Hawk, because it was originally supposed to be the third section of Storyteller, but it kept getting longer ... and longer ... until I finally decided to cut it free to be its own book. Also, before I can finish Ash Spear, I'll need to make another trip to Wales to make sure I've got the scenery right. I can hear the groans of sympathy already. A busy Monday, so no substantial posts. I did find time to rearrange some of the links in the blue sidebar, breaking out the review site links from those which take you directly to purchase or download pages. In the latter category is the link to my Lulu storefront, where aside from print and ebook versions of Storyteller you'll also find my two collections of mostly SCA- and Welsh-related poetry. The download versions of these are currently free, so help yourself if you're interested. It's good for the tomatoes, though! ...because I've been writing instead. I'm getting close to the end of Hawk - 83% complete according to my planning spreadsheet - and felt the need of a couple of long weekends in order to build up momentum, so I took today off. Fortunately, I have plenty of annual leave stockpiled and an understanding boss, and so far it's been worth it. Old English, btw, is fun - I'm finally getting some use out of all that German I took in college! I think I'll close with a quote from Storyteller. "There are two points of balance in the turning year: midsummer and midwinter, when the sun reaches its highest and lowest points. As in the brightest, longest days we can foresee the decline into darkness, so in the pit of darkness we can look upwards and foresee the light. In hope and in despair are each the seeds of the other: in the year, and in the life of a man." I'm quoting from another source today, Liam Breatnach's Uraicecht Na Riar - The Poetic Grades in Early Irish Law. This is yet another out-of-print publication from Dublin Institute For Advanced Studies. This text doesn't seem to be available on CELT either, though some of its relatives are. Only one thing was required of a bard: natural ability. ("A bard, then: without the prerogative of learning, but intellect alone.") By contrast, to qualify as a fili required both ability and study, and ideally proper family background as well. The classification of the filid implies that the various grades could be progressively attained by a course of study sufficient to acquire the knowledge and facility required of that grade. For example, the lowest grade fili, the fochloc, was required to master the four forms of the dian meter and to know 30 tales. The next grade, the macfuirmid, was required to master setrad and know 40 tales. And so it went, up to the ollam, who composed in the anamain form and knew 350 stories, as well as much other "lore" besides. Uraicecht Na Riar does not give the years of study required for all of this, but later documents suggest it could take up to twenty. To quote from Breatnach (pp 87-89), "[a]n essential feature of the seven grades of poets is that they are the successive stages in a progression which an individual may make in his own lifetime ... The distinction between one grade and another is one of the extent of the poet's learning ... Nowhere, however, do we find mention of the bards progressing from grade to grade." None of the seven grades of filid or the seven (or eight, or sixteen) grades of baird, not even the lowest, are regarded as pupils, because each has his "honor-price, retinue, and powers of protection, which indicates that he is a person of independent legal standing ... Progress up through the grades is dependent on increasing one's learning. He does however have, as it were, a license to practice. That a specific metre, with its corresponding reward is assigned to him ... shows clearly that he practised as a poet ... 'he who does not compose does not learn.'" On that note, I will temporarily conclude this series of posts, in order to go away and compose. To quote another Irish source (of which more later), "he is not a poet who does not have stories." And I have more to tell. The fili or poet (plural filid) was the only lay professional who had full nemed ("privileged") status. His most important function was to praise and to satirize, reflecting early Celtic society's preoccupation with honor and fame. Early Irish literature contains a number of references to the power of a poet's satire to raise facial blemishes on its target or even to kill. Conversely, one of the duties of the the chief poet, or ollam, was to remain in the king's presence in order to protect him from sorcery. The poet was also frequently credited with the power of prophecy, accomplished according to various rituals (compare the prophecies attributed to early Welsh bards such as Taliesin and Myrddin). The poet received a fee (duas) for each poem he composed, the rate of payment depending on his poetic grade and the form of the composition. For the anamain, or most difficult form, attempted only by the ollam, the payment was a chariot, while the least prestigious form or dian merited only a three-year-old dry heifer and a cauldron. An Irish triad says that the three "whose coffers are of unknown depth" were "a king, the Church, and a great poet." However, standards must be met: if the poet was fraudulent "through overcharging or through inadequacies in the subject matter of his poem," he could lose his privileged status. He was, however, entitled to his fee even though his composition suffered from the fault of rudrach or "monotony." The law-texts list seven grades of fili, ranging from the ollam or chief poet, who had an honor-price equal to that of the king of a tribe and was accompanied by a retinue of 24 persons, to the lowest grade fili or fochloc, who had an honor price equivalent to a yearling bullock and a two-year-old heifer, and was accompanied by two people. The comparable seven grades of bard, or lower-status poets (16 grades in some texts!) had half the honor-price of the equivalent grade of fili. The essential differences between the two orders, as mentioned before, were the bards' lack of professional training and poetic pedigree. Next: the training and repertoire of a poet. Surviving law texts are much more abundant for Ireland than for Wales, and the core material in many of them dates back to the 7th and 8th centuries, as opposed to the 9th - 10th century Law of Hywel. This does not, however, make the researcher's job easier; on the contrary, the abundance of exemplars means we have many more disagreements among them. In addition, lawyers seem to have been plentiful in ancient Ireland, and the resulting classifications of things and people - such as bards and poets - is intricate to a degree. The main distinctions, however, are "1) between those who are nemed 'privileged', and those who are not nemed, and 2) between those who are soer 'free' and those who are doer 'unfree'." Poets and bards - there is a distinction - are among the "men of art", those who are nemed because of their knowledge and skills rather than their political power or wealth. Among the "men of art", it is only the poet who has full nemed status. The two main categories of poets recognized were the fili and the bard. Both of these groups were divided legally in seven or more subgroups, of which more presently. The chief differences between the two, however, were their degree of education and their pedigree. Poetry was a hereditary profession: "a poet is expected to be the son and grandson of a poet." On that basis, few of us would qualify today! Check out the design concept for the new book's cover in the sidebar. 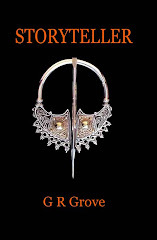 The hawk image is another jewelry design by Urweg, who produce the museum replica brooch on the Storyteller cover. I like the intertwining elements, which remind me of some of the later Pictish designs. Another silent weekend on the blog, another active weekend with Flight of the Hawk. Summer is starting to warm up here in Denver; on the other hand, my protagonists are now well into their autumn. It seems that whenever I start a writing project -- even if it's originally in sync with the season -- I presently find myself having to imagine summer's heat at midwinter, or vice versa. Somehow writing never proceeds at the same pace as the exterior world's seasons. And even if it does for a while, by the time you come back to polish and revise, it's out of sync again. Storyteller, of course, covered a year, from one year's Beltane to the next. A good period of time, and appropriate to a Celtic mythology-based tale: so often the Mabinogi speaks of "blwyden y heno" -- "a year tonight," the period it takes for the magic to work. Hawk, on the other hand, covers six months -- Beltane to Samhain, the bright half of the year. How to keep synchronized? I don't think there is a way. Like the Fairy Realm, where a few days may pass while as many years go by on Middle Earth, the time of the imagination forever proceeds at a different pace. The writer can only try and follow. The next book, I think, will start in the spring -- but that is another story. The first two sections of this post on Bards and the medieval Welsh laws have touched on the two highest classes of bards, the pencerdd and the bardd teulu. These are both bards attached to the King's court, and therefore of high status. The third class of bard mentioned in the Law of Hywel is the cerddor or minstrel. The Law has much less to say about the cerddor, and what it does say paints a different pattern. The cerddor is not an officer, and has no specific rights and privileges more than those of any other free man. We know that he is likely to be that, at least, for the three arts a villein is not entitled to learn without his lord's permission are "clerkship and smithcraft and bardism." Like the master-smith, the pencerdd is entitled to the amobr-payment of the daughters of his subordinates, the cerddorion, on the occasion of their marriage. The cerddor, however, can better his lot by education. The Law says, "Every harp pencerdd is entitled to twenty-four pence from the young cerddorion who want to give up the horsehair[-strung] harp and be competent cerddorion and to solicit." Furthermore, this payment is to be paid by "each cerddor after he leaves his instruction" - in effect, a payment for the master's teaching. The above passage hints at different levels among the cerddorion, as is only to be expected. Still, there is little sign of the highly organized grades of bards and poets that existed in Ireland at this period. But that is a separate subject. For now, best wishes for the weekend - I'll be writing, not blogging! I'll be posting more on bards soon, possibly later today, but in the meantime I thought I'd give you a short update on my writing progress. 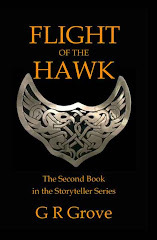 My current book, The Flight of the Hawk, takes up where Storyteller left off, and follows my narrator Gwernin and his friend Neirin on a trip to the north of Britain. Their mission: to investigate the rumors of unrest between the various Kings and kingdoms, and do what they can to encourage peace. At least, that was the idea ... but the two young bards find plenty of other adventures along the way, ranging from the expected (girls, beer...) to the supernatural, and from the amusing to the potentially fatal. The bardd teulu, or Bard of the Household, was one of the fourteen officers of the court. His privileges and entitlements were many, and are enumerated in the Law. As one of the King's officers, he was entitled to his land free of payment, and his horse when he attended the King. When he accompanied the King on his circuit, the Bard lodged with the Captain of the retinue, and at the three special feasts of the year he had a seat next to Captain, "so as to have the harp put into his hand." At the feasts he received his woolen clothing from the King and his linen clothing from the Queen; he was also entitled to the Steward's old clothes -- and his old clothes went to the Doorkeeper! When the King led his warband into a strange company, the Bard was entitled to a cow or ox from the booty, after the King had chosen his third share. It was also his duty to sing something called The Sovereignty of Britain during the sharing out. When the Bard traveled with other bards, he was entitled "to two men's share." During the feasting, after the pencerdd or chaired bard had sung, the Bard was to sing "three songs of some other kind." It was also his job to sing for the Queen "without stint" whenever she wanted a song, but that "quietly, so that the hall is not disturbed by him." He was entitled "to a whalebone throwboard from the King and a gold ring from the Queen," presumably when he took up his post. In addition, he was obliged to give a gold ring to the Chief Justice on some unspecified time. His sarhaed, or honor price, was "six kine and six score pence". His worth (to be paid to his kindred if he was killed unlawfully) was "six kine and six score kine with augmentation." Next: The Cerddor or minstrel. I was hoping to post on bards again today, but too much work landed in my inbox. Hopefully I'll have another installment monday - in the meantime, have a good weekend! There are three classes of bard mentioned in the Law of Hywel: the pencerdd, or master bard; the bardd teulu, or bard of the household; and the cerddor, or singer. The Law has a good bit to say about the first two, and rather less about the third, but much of it is intermingled with other material and must be separated out by the curious reader. This post will be about the pencerdd; I will take up the other two classes of bards later. The pencerdd (pronounced pen-kerth) or master bard is defined as "the bard when he wins a chair," i.e., a bardic competition. His seat in the court is next to the court justice, and his lodging with the edling, or King's heir. He is one of the fourteen persons who have chairs in court. He sings first at the feasting, and sings two songs: one praising God, and one praising the King. He pays no fees to the King for his land, but rather receives payments from others: twenty-four pence from each of his pupils when he leaves the master's instruction, and twenty-four pence from every maiden when she marries. In addition, the pencerdd can solicit, or receive payment, from those for whom or about whom he sings, and that without competition: "No bard can solicit for anything within his pencerdd area, without his permission, unless he is a bard from a strange country. Even if the King forbids the giving of goods within his realm until the end of a period, the pencerdd will be free of the law." Moreover, "from what he and his companions gain together he is entitled to have two shares." With all of this, it is clear why the pencerdd's Irish equivalent was described as one of three whose wealth could not be measured. Next: the Bard of the Household. Well, things were moderately productive at Tre Gwernin this weekend, even if not on the blog itself. I got a narrative problem resolved which had been hindering progress on The Flight of the Hawk for about a month. Great relief ... the problem was that I had the right story but was dithering about location. If I can't make it work on the map, I can't make it work in my mind. Right location, problem solved ... onward! Have a good weekend, folks. I probably won't be posting much before tuesday - too much writing and gardening to do - and I hope you have something better to do than read blogs as well! The picture at the left is of my two cats (Falco and Titus) four years ago, when they were half-grown. Basic tabbies, they are the type of cat which would have been around in Gwernin's day. We're not sure just when domestic cats arrived in Britain - the European wild cat, of course, was already there - but it seems certain that the Romans brought more with them. They were valued for their mousing, as the Law of Hywel shows: "The value of a cat, fourpence. The value of a kitten from the night it is born until it opens its eyes, a legal penny; and from then until it kills mice, two legal pence; and after it kills mice, four legal pence, and at that it remains for ever. Her properties are to see and hear and kill mice, and that her claws are not broken, and to rear kittens; and if she is bought, and any of those is wanting, a third of her value is to be returned ... The value of a cat which guards a king's barn, if killed ... her head is set down on a clean level floor, and her tail is raised up, and wheat grains are poured over her until they hide the end of her tail. That will be her value; if the grain is not obtained, a milking ewe with her lamb and her wool." If a couple divorces, "the man is entitled to all the hens, and to one of the cats, with the rest for the woman." Cats are also mentioned in one of the Arthurian poems in the Black Book of Caermyrddin, "Pa Gwr",where Kay, Arthur's foster-brother, goes to Ynys Mon to destroy a monster called Cath Paluc (Paluc's Cat). Possibly she was an early version of the mysterious black cats still being observed in western Britain today! Having built up a backlog of posts on this site for perusal by those interested, I'm going to slow the rate of substantial posts down to a couple a week. This doesn't mean I won't be putting other things on from time to time as well. It's just that I've found out, like many other writers before me, that time spent blogging is not time spent working on the next book. I'm also feeling more than usually aware of the fragility and finiteness of life. In the last month two people I knew fairly well - one a next door neighbor, another a friend - have died suddenly. Things unsaid, things not yet done, press about me. I need to do them now. Thinking about medieval food brings up the subject of New World introductions: a fairly large percentage of what we -- Europeans and North Americans -- normally eat originated in the Americas. To see how large, let's look at some common menus. Breakfast first. Bacon, eggs, and toast are on firm ground: the ingredients, if not the manner of preparation, were available in 6th century Britain. Oatmeal porridge with milk or cream is also safe. Cornflakes, however, are right out: maize is New World. Lunch is a bit more of a problem. Hamburgers are fine, as long as you leave off the (tomato based) catchup, but you can't have fries with them. Potatoes are New World. Salad greens are mostly safe, and so are cucumbers, but again no tomatoes. Olive oil and vinegar are Mediterranean, and garlic. So are most pizza ingredients, if you leave off the (tomato) sauce. And so to dinner. Contemporary feasting, like its medieval counterpart, includes large cuts of meat. Beef, pork, lamb, and chicken are no problem. Turkey is North American, as some of us notice every November. As I've already said, no potatoes, no tomatoes, no corn on (or off) the cob, and definitely no baked beans (all our beans except fava beans and related broad beans are New World). Rice was Old World, though probably not available in 6th century Britain, and the ingredients for pasta were there, though again probably not the thing itself. Beets and turnips are European. Many if not most hot peppers are originally New World; so are sweet peppers. Pumpkin or blueberry pie wasn't available, but apples, strawberries, dates and almonds have all been found in Roman deposits. The Romans had plenty of wine, and the Celts and Germans made beer in great quantity, but there was no tea or coffee in medieval Europe -- and definitely no chocolate! I'm getting ready now for a long weekend of SCA activity, so there'll probably be no new posts on this blog until Monday. In the meantime, for those of you who haven't seen it, I direct your attention to some of the background on how I came to write Storyteller -- here. The SCA is where I learned my bardic craft, and one of the places I practice it. And to see what we get up to in August, look here. How Many Mabinogi? or, What's in My Library? Last July, as I have in 7 out of 10 of the last summers, I attended Cymdeithas Madog's one-week intensive Welsh Course, known to its friends as Cwrs Cymraeg. On Tuesday night we had "Pub Night", which included a quiz session, and one of the questions was "How many stories make up the Mabinogion?" As usual, I knew a little too much for my own good, so I asked in return, "Whose version?" The person asking the questions replied "My version!" which didn't help. If she had said, "Lady Charlotte Guest's version," I would have got the answer right, and it would have been "12". (No, not "42" - that's a different blog!) But I answered "11", and was adjudged wrong. To explain my confusion, I should say that I collect versions of the Mabinogion. There are more than you might think, especially when you count scholarly editions of individual stories. The version most familiar to English-speakers, however, is the first English translation, published by Lady Charlotte Guest in the 1850's. It consisted of eleven stories from two 14th and 15th century Welsh manuscripts, plus the Tale of Taliesin from a much later source. Let's start with the manuscripts. Of the two mentioned (the Red Book of Hergist and the White Book of Rhydderch), I have an edition of part of the latter, with additions from the Red Book -- Llyfr Gwyn Rhydderch: Y chwedlau a'r Rhamantau, edited by J. Gwenogvryn Evans and R. M. Jones and published by Gwasg Prifysgol Cymru in Caerdydd in 1973. Without going into details, this book contains the four related tales called Pedeir Kainc y Mabinogi (the Four Branches of the Mabinogi), the three Arthurian romances (Peredur, Gereint, and Owein), Breudwyt Maxen Wledic (M. W.'s Dream), Llud a Llevelis, Breudwyt Ronabwy (R.'s Dream), and the older Arthurian tale Kulhwch ac Olwen: a total of eleven stories. Moving on to Modern Welsh editions and retellings, I have Y Mabinogion by Dafydd and Rhiannon Ifans (eleven stories), Gwerthfawrogi'r Chwedlau by Rhiannon Ifans (5 assorted tales with Welsh commentary), Y Mabinogi by Gwyn Thomas (an illustrated translation/adaptation of the Four Branches, aimed at children but equally delightful for adults), Culhwch ac Olwen (ditto), and several smaller excerpts and/or learner's versions of individual tales which I won't bother to catalogue. On, then, to the English translations! The Mabinogion, translated by Gwyn Jones and Thomas Jones, is the most literal rendition and my favorite (I have two editions). This has the eleven tales from the Red and White books. My next favorite, Patrick K. Ford's The Mabinogi and Other Medieval Welsh Tales, has seven stories: the familiar Four Branches, Lludd and Lleuelys, Culhwch and Olwen, and his translation of the Tale of Taliesin (the first new English translation since Lady Charlotte Guest's, and from an earlier manuscript than the one she used). Then there is Jeffrey Gantz's The Mabinogion (eleven stories), and finally a new edition which I just acquired and recommend highly, Sioned Davies' The Mabinogion (eleven stories). Why did she call it The Mabinogion, when most of my other versions use Y Mabinogi? Ah, that is a post for another day.